From the Archive: The assault by radical Islamists on the U.S. consulate in Benghazi, killing U.S. Ambassador to Libya J. Christopher Stevens and three of his aides, underscores the under-reported risk of the U.S.-backed military campaign against Libyan dictator Muammar Gaddafi, as Robert Parry noted in 2011. American neoconservatives worried that the pro-democracy wave sweeping the Middle East might take out only “moderate” Arab dictators, but the neocons then saw hope that uprisings would topple “enemy” regimes in Libya and Syria. Yet, in rallying U.S. support for these rebellions, the neocons risked repeating the mistake they made by pushing the U.S. invasion of Iraq. They succeeded in ousting Saddam Hussein, who had long been near the top of Israel’s enemies list, but the war also removed him as a bulwark against both Islamic extremists and Iranian influence in the Persian Gulf. 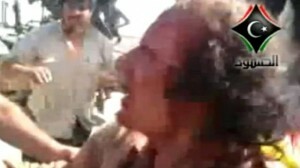 Amateur video of Muammar Gaddafi after he was captured in the town of Sirte, Libya, on Oct. 20, 2011. Shortly afterwards, he was shot dead. In 2011, the neocons sought a stronger U.S. military intervention in Libya to oust Col. Muammar Gaddafi (another old Israeli nemesis) and urged more support for protesters in Syria to overthrow the Assad dynasty (regarded as a frontline enemy of Israel). However, by embracing these uprisings, the neocons invited unintended consequences, including further Islamic radicalization of the region and deepening anti-Americanism. Indeed, a rebel victory over Gaddafi risked putting extremists from an al-Qaeda affiliate in a powerful position inside Libya. The major U.S. news media aided the neocon cause by focusing on Gaddafi’s historic ties to terrorism, including the dubious charge that he was behind the Pan Am 103 bombing in 1988. There was little attention paid to his more recent role in combating the surge in al-Qaeda activity, especially in eastern Libya, the base of the revolt against him. Similarly, Bashar al-Assad’s Syrian government has repressed Islamic extremism inside its borders, in part, because Islamic fundamentalists despise the Alawite religion of Syria’s rulers, considering it a form of apostasy that must be stamped out. So Assad and Gaddafi had their own political reasons to be enemies of al-Qaeda, the terrorist organization which U.S. officials cite as the greatest national security threat to the American homeland. In their report entitled “Al-Qaeda’s Foreign Fighters in Iraq,” Felter and Fishman also analyzed al-Qaeda documents captured in 2007 showing personnel records of militants who flocked to Iraq for the war. The documents revealed that eastern Libya (the base of the anti-Gaddafi rebellion) was a hotbed for suicide bombers traveling to Iraq to kill American troops. “Both Darnah and Benghazi have long been associated with Islamic militancy in Libya, in particular for an uprising by Islamist organizations in the midâ€1990s. … One group, the Libyan Fighting Group , claimed to have Afghan veterans in its ranks,” a reference to mujahedeen who took part in the CIA-backed anti-Soviet war in Afghanistan in the 1980s, as did al-Qaeda founder, Osama bin Laden, a Saudi. The authors added that Abu Layth alâ€Libi, Emir of Libyan Islamic Fighting Group (LIFG), “reinforced Benghazi and Darnah’s importance to Libyan jihadis in his announcement that LIFG had joined alâ€Qa’ida. Some important al-Qaeda leaders operating in Pakistan’s tribal regions also are believed to have come from Libya. For instance, “Atiyah,” who was guiding the anti-U.S. war strategy in Iraq, was identified as a Libyan named Atiyah Abd al-Rahman. It was Atiyah who urged a strategy of creating a quagmire for U.S. forces in Iraq, buying time for al-Qaeda headquarters to rebuild its strength in Pakistan. As in the anti-Islamist crackdown of the 1990s, Gaddafi used harsh rhetoric in vowing to crush the Benghazi-based rebellion in 2011. Those threats were cited by President Barack Obama and other leaders as a key reason for securing a United Nations resolution and establishing a no-fly zone over Libya, to protect the rebels and civilians in eastern Libya. Yet, while intervening to save lives in eastern Libya, Obama and other Western officials seemed to know little about whom they were saving. Journalists also failed to identify the leaders behind the revolt. However, in a personal letter to Obama, Gaddafi cited the role of terrorists in this new uprising. Though Gaddafi clearly had a self-interest in portraying the rebels as al-Qaeda terrorists — and the rebels surely included many common citizens simply fed up with Gaddafi’s authoritarian rule — the report from West Point’s Combating Terrorism Center lent some credence to his claims. Still, influential American neocons and major U.S. news outlets portrayed the Libyan clash as simply a case of a brutal dictator, who has his own terrorist baggage, crushing a popular movement of innocent citizens seeking democracy and freedom. Despite the warning signs of possible Islamist influences over the rebel forces, American neocons grabbed the steering wheel of this wider-war bandwagon as it picked up speed. Clearly pining for the days of George W. Bush’s muscular unilateralism, the Post’s editors demanded that Obama take the lead in implementing a military strategy that ensures regime change in Tripoli. “If the regime’s heavy weapons were systematically targeted, the rebels could surge forward,” the Post wrote. “All this would require Mr. Obama to do something he has avoided from the beginning in Libya: Exercise U.S. leadership. Charles Krauthammer, one of the Post’s prominent neocon columnists, weighed in with his own typically snarky column on March 24, 2011, also demanding that Obama take decisive action against Gaddafi. The New York Times, another newspaper with strong neocon tendencies, took the case for regime change in Libya into its news columns, as it did regarding Iraq in 2002-03 when the Times acted as a conveyor belt for the Bush administration’s propaganda about Iraq’s non-existent WMD. This combination of ignorance about the internal politics of Libya (i.e. who are the rebels?) and the misplaced certainty of the U.S. press corps about another designated villain (supposed Pan Am 103 terrorist mastermind Gaddafi) set the stage for a potential repeat of the Iraq disaster. In Iraq, it turned out that Saddam Hussein, who had destroyed his stockpiles of WMD, was serving as a bulwark against both al-Qaeda-style terrorism and Iranian influence. His removal advanced both Islamic terrorist movements across the region and Iran’s power in the Persian Gulf. In Libya, the neocons baited Obama into a wider war to overthrow Gaddafi. But they appear as ill-informed about the possible consequences in Libya as they did in Iraq: If the “rebels” are influenced or controlled by al-Qaeda-style terrorists, would they inflict massacres of Gaddafi’s supporters, thus flipping the notion of a humanitarian intervention? Would a rebel victory give the Islamic terror groups of eastern Libya a foothold in or possible control of the whole country and its oil wealth? Would the prospect of an al-Qaeda affiliate in charge of a strategically placed Arab country require the United States to commit ground troops to the conflict to prevent an outcome that the U.S. intervention had unintentionally caused? Over the past several decades as the neocons have grown in influence inside the U.S. political/media circles, one of their consistent characteristics has been to advocate wars against perceived “enemies” in the Muslim world. But the neocons’ lack of realism and their enthusiasm to do whatever they think might be helpful to Israel have often made them the classic sorcerer’s apprentice, stirring up trouble that grows worse and worse without knowing how to bring the chaos under control. Yet, despite their war-mongering incompetence, the neocons have one great strength: they are clever enough — and well-connected enough — to block any accountability. Even when their policies go horribly wrong, they can simply reframe the narrative to make themselves out to be the smart ones. Until their ability to rewrite the history is countered, the neocons can be expected to continue leading the United States into disaster after disaster. We get from Rehmat what we expect from Rehmat.Namely garbage. Wow is this guy joking. No radical Islamist in Libya? What about the 2007 West Point Study that showed that Libya (East Libya specifically) produced the most jihadist per capital than all Arab countries who fought against US soldiers in Iraq in 2007. What about the Libyan commander who admitted to an Italian paper of having fought US troops in Afghanistan and having recruited men to fight US troops in Iraq. There is also a report by two French think tanks that note East Libya as being a hot bed for Islamist. Plus the group that did the embassy attack that killed the ambassador is an Islamist group Ansar Al Sharia meaning “Those Who Want Sharia”. And Gaddafi didn’t have good relations with the West. Libya for some 10 years had brutal UN sanctions imposed on Libya and had a ban on its oil. The sanctions were due to Libya being blamed for the Lockerbie bombing where the US bribed the key witness $2-3 million to point to Megrahi as the culprit. Gaddafi had to do a deal with the West in order to get these sanctions removed. WikiLeaks show Gaddafi was forcing Western oil companies to pay up for the expenses related to the Lockerbie bombing. Relations where not good and were embarrassing for the UK especially when word got out of BP lobbying the UK gov for the release of the Locker bomber.